Bertrand Russell, "IS THERE A GOD?" 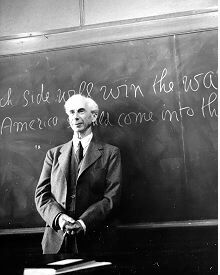 Bertrand Russell (18721970) studied mathematics at Trinity College, Cambridge, and later took up a fellowship there. He began writing in the 1890s, and his Principles of Mathematics (1903) is a landmark work on the philosophy of mathematics. The brief paper On Denoting (1905) created a revolution in philosophy, especially in the realms of epistemology and the philosophy of language; it was followed by such works as Our Knowledge of the External World (1914), An Inquiry into Meaning and Truth (1940), and Human Knowledge: Its Scope and Limits (1948). Russell eventually came to believe that sci­entific knowledge must be the basis both of philosophical inquiry and of human conduct. A prolific writer, Russell also espoused numerous social and political causes: in his long life he protested both World War I and the Vietnam War. 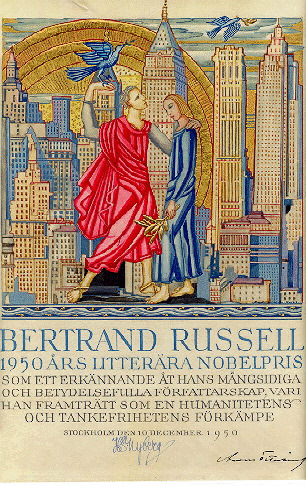 He frequently criticized orthodox religion, and thereby became embroiled in a celebrated controversy in 1940 when his appointment as a visiting lecturer at City College, New York, was with­drawn as a result of protests from Catholics who believed Russell to be an atheist and proponent of free love (a view arrived at by misreadings of such works as Marriage and Morals, 1929). * Ten years later he was awarded the Nobel Prize for literature. Some of Russells writings on religion can be found in Skeptical Essays (1928), Unpopular Essays (1950), and Why I Am Not a Christian (1957). In the following essaycommissioned by Illustrated, a London magazine, in 1952 but not published thereRussell refutes many of the standard arguments for the existence of God. Kollner (London: Routledge, 1997), pp. 543-48. Copyright C 1997 by Routledge. QUESTION weither there is a God is one which is decided on very different grounds by different communities and different indi­viduals. The immense majority of mankind accept the prevailing opinion of their own community In the earliest times of which we have definite history everybody believed in many gods. It was the Jews who first believed in only one. The first commandment, when it was new, was very difficult to obey because the Jews had believed that Baal and Ashtaroth and Dagon and Moloch and the rest were real gods but were wicked because they helped the enemies of the Jews. The step from a belief that these gods were wicked to the belief that they did not exist was a difficult one. There was a time, namely that of Antiochus IV, when a vigorous attempt was made to Hellenize the Jews. Antiochus decreed that they should eat pork abandon circumcision, and take baths. Most of the Jews in Jerusalem submitted, but in country places resistance was more stubborn and under the leadership of the Maccabees the Jews at last established their right to their peculiar tenets and customs Monothiesm, which at the beginning of the Anti­ochan persecution had been the creed of only part of one very small nation, was adopted by Christianity and later by Islam, and so became dominant throughout the whole of the world west of India. From India eastward, it had no success: Hinduism had many gods; Buddhism in its primitive form had none; and Confucianism had none from the eleventh century onward. But, if the truth of a religion is to be judged by its worldly success, the argument in favor of monotheism is a very strong one, since it possessed the largest armies, the largest navies, and the greatest accumula­tion of wealth. In our own day this argument is growing less decisive. [i] It is true that the un-Christian menace of Japan was defeated. But the Christian is now faced with the menace of atheistic Muscovite hordes, and it is not so certain as one could wish that atomic bombs will provide a conclusive argument on the side of theism. But let us abandon this political and geographical way of considering religions, which has been increasingly rejected by thinking people ever since the time of the ancient Greeks. Ever since that time there have been men who were not content to accept passively the religious opinions of their neighbors, but endeavoured to consider what reason and philos­ophy might have to say about the matter. In the commercial cities of lonia, where philosophy was invented, there were free-thinkers in the sixth century B.C. Compared to modem free-thinkers they had an easy task, because the Olympian gods, however charming to poetic fancy were hardly such as could be defended by the metaphysical use of the unaided reason. They were met popularly by Orphism (to which Christianity owes much) and, philosophically, by Plato, from whom the Greeks derived a philosophical monotheism[ii] very different from the political and nation­alistic monotheism of the Jews. When the Greek world became converted to Christianity it combined the new creed with Platonic metaphysics and so gave birth to theology. Catholic theologians, from the time of Saint Augustine to the present day, have believed that the existence of one God could be proved by the unaided reason. Their arguments were put into final form by Saint Thomas Aquinas in the thirteenth century. When modem philosophy began in the seventeenth century, Descartes and Leibnitz took over the old arguments, somewhat polished them up, and thus owing largely to their efforts, piety, it remained intellectually respectable. But Locke, although himself a completely convinced Christian, undermined the theoretical basis of the old arguments, and many of his followers, especially in France, became Atheists. I will not attempt to set forth in all their subtlety the philosophical arguments for the existence of God. There is, I think, only one of them which still has weight with philosophers, that is the argument of the First Cause. This argument maintains that, since everything that happens has a cause, there must be a First Cause from which the whole series starts. The argument suffers, however, from the same defect as that of the elephant and the tortoise. It is said (I do not know with what truth) that a certain Hindu thinker believed the earth to rest upon an elephant. When asked what the elephant rested upon, he replied that it rested upon a tortoise. When asked what the tortoise rested upon, he said, I am tired of this. Suppose we change the subject. This illustrates the unsatisfactory character of the First-Cause argument. Nev­ertheless, you will find it in some ultra-modem treatises on physics, which contend that physical processes, traced backward in time, show that there must have been a sudden beginning and infer that this was due to divine Creation. They carefully abstain from attempts to show how this hypothesis makes matters more intelligible. The scholastic arguments for the existence of a Supreme Being are now rejected by most Protestant theologians in favor of new arguments which to my mind are by no means an improvement. The scholastic arguments were genuine efforts of thought and, if their reasoning had been sound, they would have demonstrated the truth of their conclu­sion. The new arguments, which Modernists prefer, are vague; and the Modernists reject with contempt every effort to make them precise. There is an appeal to the heart as opposed to the intellect. It is not maintained that those who reject the new arguments are illogical, but that they are destitute of deep feeling or of moral sense. Let us never­theless examine the modern arguments and see whether there is any­thing that they really prove. One of the favourite arguments is from evolution. The world was once lifeless, and when life began it was a poor sort of life consisting of green slime and other uninteresting things. Gradually by the course of evolution, it developed into animals and plants and at last into MAN. Man, so the theologians assure us, is so splendid a Being that he may well be regarded as the culmination to which the long ages of nebula and slime were a prelude. I think the theologians must have been for­tunate in their human contacts. They do not seem to me to have given due weight to Hitler or the Beast of Belsen. [iii] If Omnipotence, with all time at its disposal, thought it worth while to lead up to these men through the many millions of years of evolution, I can only say that the moral and aesthetic taste involved is peculiar. However, the theologians no doubt hope that the future course of evolution will produce more men like themselves and fewer men like Hitler. Let us hope so. But, in cherishing this hope, we are abandoning the ground of experience and taking refuge in an optimism which history so far does not support. epochs. In this brief interlude, there is a much briefer one containing man. If really man is the purpose of the universe, the preface seems a little long. One is reminded of some prosy old gentleman who tells an interminable anecdote all quite uninteresting until the rather small point in which it ends. I do not think theologians show a suitable piety in making such a comparison possible. It has been one of the defects of theologians at all times to over-esti­mate the importance of our planet. No doubt this was natural enough in the days before Copernicus when it was thought that the heavens revolve about the earth. But since Copernicus and still more since the modern exploration of distant regions, this pre-occupation with the earth has become rather parochial. If the universe had a Creator, it is hardly reasonable to suppose that He was specially interested in our little corner. And, if He was not, His values must have been different from ours, since in the immense majority of regions life is impossible. There is a moralistic argument for belief in God, which was popular­ized by William James. [iv] According to this argument, we ought to believe in God because, if we do not, we shall not behave well. The first and greatest objection to this argument is that at its best, it cannot prove that there is a God but only that politicians and educators ought to try to make people think there is one. Whether this ought to be done or not is not a theological question but a political one. The arguments are of the same sort as those which urge that children should be taught respect for the flag. A man with any genuine religious feeling will not be content with the view that the belief in God is useful, because he will wish to know whether, in fact, there is a God. It is absurd to contend that the two questions are the same. In the nursery, belief in Father Christmas is useful, but grown-up people do not think that this proves Father Christmas to be real. Since we are not concerned with politics, we might consider this suf­ficient refutation of the moralistic argument, but it is perhaps worth­while to pursue this a little further. It is, in the first place, very doubtful whether belief in God has all the beneficial moral effects that are attrib­uted to it. Many of the best men known to history have been unbe­lievers. John Stuart Mill may serve as an instance. And many of the worst men known to history have been believers. Of this there are innu­merable instances. Perhaps Henry VIII may serve as typical. However that may be, it is always disastrous when governments set to work to uphold opinions for their utility rather than for their truth. As soon as this is done it becomes necessary to have a censorship to suppress adverse arguments, and it is thought wise to discourage thinking among the young for fear of encouraging dangerous thoughts. When such mal­practices are employed against religion as they are in Soviet Russia, the theologians can see that they are bad, but they are still bad when employed in defense of what the theologians think good. Freedom of thought and the habit of giving weight to evidence are matters of far greater moral import than the belief in this or that theological dogma. On all these grounds it cannot be maintained that theological beliefs should be upheld for their usefulness without regard to their truth. There is a simpler and more naive form of the same argument, which appeals to many individuals. People will tell us that without the consolations of religion they would be intolerably unhappy. So far as this is true, it is a cowards argument. Nobody but a coward would con­sciously choose to live in a fools paradise. When a man suspects his wife of infidelity, he is not thought the better of for shutting his eyes to the evidence. And I cannot see why ignoring evidence should be con­temptible in one case and admirable in the other. Apart from this argu­ment the importance of religion in contributing to individual happi­ness is very much exaggerated. Whether you are happy or unhappy depends upon a number of factors. Most people need good health and enough to eat. They need the good opinion of their social milieu and the affection of their intimates. They need not only physical health but mental health. Given all these things, most people will be happy what­ever their theology. Without them, most people will be unhappy, what­ever their theology. In thinking over the people I have known, I do not find that on the average those who had religious beliefs were happier than those who had not. When I come to my own beliefs, I find myself quite unable to dis­cern any purpose in the universe, and still more unable to wish to dis­cern one. Those who imagine that the course of cosmic evolution is slowly leading up to some consummation pleasing to the Creator, are logically committed (though they usually fail to realize this) to the view that the Creator is not omnipotent or, if He were omnipotent, He could decree the end without troubling about means. I do not myself perceive any consummation toward which the universe is tending. According to the physicists, energy will be gradually more evenly distributed and as it becomes more evenly distributed it will become more useless. Gradually everything that we find interesting or pleasant, such as life and light, will disappearso, at least, they assure us. The cosmos is like a theatre in which just once a play is performed, but, after the curtain falls, the theatre is left cold and empty until it sinks in ruins. I do not mean to assert with any positiveness that this is the case. That would be to assume more knowledge than we possess. I say only that it is what is probable on present evidence. I will not assert dogmatically that there is no cosmic purpose, but I will say that there is no shred of evidence in favor of there being one. I will say further that, if there be a purpose and if this purpose is that of an Omnipotent Creator, then that Creator, so far from being loving and kind, as we are told, must be of a degree of wickedness scarcely conceivable. A man who commits a murder is considered to be a bad man. An Omnipotent Deity, if there be one, murders everybody [emphasis inserted by JK]. A man who willingly afflicted another with cancer would be considered a fiend. But the Creator, if He exists, afflicts many thousands every year with this dreadful disease. A man who, having the knowledge and power required to make his children good, chose instead to make them bad, would be viewed with execration. But God, if He exists, makes this choice in the case of very many of His children. The whole conception of an omnipotent God whom it is impious to criticize, could only have arisen under oriental despotisms where sovereigns, in spite of capri­cious cruelties, continued to enjoy the adulation of their slaves. It is the psychology appropriate to this outmoded political system which belat­edly survives in orthodox theology. There is, it is true, a Modernist form of theism, according to which God is not omnipotent, but is doing His best, in spite of great difficul­ties. This view, although it is new among Christians, is not new in the history of thought. It is, in fact, to be found in Plato. I do not think this view can be proved to be false. I think all that can be said is that there is no positive reason in its favour. Many orthodox people speak as though it were the business of scep­tics to disprove received dogmas rather than of dogmatists to prove them. This is, of course, a mistake. If I were to suggest that between the Earth and Mars there is a china teapot revolving about the sun in an elliptical orbit, nobody would be able to disprove my assertion pro­vided I were careful to add that the teapot is too small to be revealed even by our most powerful telescopes. But if I were to go on to say that, since my assertion cannot be disproved, it is intolerable presumption on the part of human reason to doubt it, I should rightly be thought to be talking nonsense. If, however, the existence of such a teapot were affirmed in ancient books, taught as the sacred truth every Sunday, and instilled into the minds of children at school, hesitation to believe in its existence would become a mark of eccentricity and entitle the doubter to the attentions of the psychiatrist in an enlightened age or of the Inquisitor in an earlier time. It is customary to suppose that, if a belief is widespread, there must be something reasonable about it. I do not think this view can be held by anyone who has studied history. Practi­cally all the beliefs of savages are absurd. In early civilizations there may be as much as one percent for which there is something to be said. In our own day (but at this point I must be careful), we all know that there are absurd beliefs in Soviet Russia. If we are Protestants, we know that there are absurd beliefs among Catholics. If we are Catholics, we know that there are absurd beliefs among Protestants. If we are Conser­vatives, we are amazed by the superstitions to be found in the Labour Party. If we are Socialists, we are aghast at the credulity of Conservatives. I do not know, dear reader, what your beliefs may be, but whatever they may be, you must concede that nine-tenths of the beliefs of nine-tenths of mankind are totally irrational. The beliefs in question are, of course, those which you do not hold. I cannot, therefore, think it presump­tuous to doubt something which has long been held to be true, espe­cially when this opinion has only prevailed in certain geographical regions, as is the case with all theological opinions. [ii] These two statements of Russell I find objectionable. First, I have no recollection of Plato denying the gods or of stating that there is but one. Second, if such be the case there are elsewhere, such as in the Euthythro, references to gods. Thirdly, if there be such a position somewhere in Platos over 1,500 pages of surviving works, it did not lead to a movement for monotheism. As to the other proposition, that the Greek polytheism was indefensible by reason, that is false. The Greeks based on observation proved there faith. There are many historical accounts of the oracles being fulfilled.--JK. [iii] The Beast of Belsen refers to Josef Kramer (1907-1945), the notori­ously cruel commander of the Nazi concentration camp at Bergen-Belsen. [iv] William James (18421910), American philosopher, founder of Pragmatism, and author of The Will to Believe (1897) and The Varieties of Religious Experience (1902). See also A. I. Ayer on James (pp. 104105).